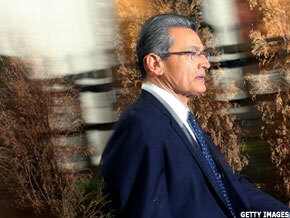 Former McKinsey head and Goldman director Rajat Gupta has been convicted of securities fraud. Updated with attorney comments and added information on appeal. NEW YORK ( TheStreet) -- After two days of deliberations on a highly watched insider trading case, a jury has convicted Rajat Gupta, the former head of consulting firm McKinsey & Co and board director of Goldman Sachs ( GS - Get Report) and Procter & Gamble ( PG - Get Report), on four felony counts and acquitted him on two charges. Gupta was convicted on three counts of securities fraud regarding tips made about Goldman Sachs and one count of conspiracy in an insider trading scheme run by hedge fund manager Raj Rajaratnam. He faces the prospect of spending decades in prison. Rajat Gupta has been convicted of securities fraud. The case centers on Gupta's leaking of insider stock information to convicted Galleon Group manager Rajaratnam regarding the earnings of Goldman Sachs in 2008, while he was a board member at the company. His tips also focused on a $5 billion financial crisis investment in Goldman that Warren Buffett-run Berkshire Hathaway ( BRK.A made at the height of the 2008 financial crisis. Gupta was acquitted of secutities fraud charges related to his alleged tip of Procter & Gamble board secrets. In May 2011, Rajaratnam was convicted on all fourteen counts of insider trading set against him by federal prosecutors and was sentenced to 11 years in prison, the harshest ever for insider trading. Rajaratnam and Gupta's convictions culminate a near five year inquest by the Securities and Exchange Commission that has so far led to over 60 arrests and to more than two dozen convictions. "Having fallen from respected insider to convicted inside trader, Mr. Gupta has now exchanged the lofty board room for the prospect of a lowly jail cell," said Preet Bharara, U.S. Attorney for Manhattan, in a statement. "Almost two years ago, we said that insider trading is rampant, and today's conviction puts that claim into stark relief. " After a nine year tenure running McKinsey, Gupta became a director at Goldman, Procter & Gamble and the parent of American Airlines as well as philanthropic organizations like the Bill and Melinda Gates Foundation. After his Friday conviction, Gupta is the highest profile executive to be caught up in the SEC's Galleon case. To be seen what prison time Gupta gets after his conviction on three counts of securities fraud and a count of conspiracy. Each securities fraud count carries a maximum sentence of 20 years in prison, while conspiracy carries a five-year maximum sentence. The New York Times reports that Gupta faces a maximum of 25 years in prison; however he is unlikely to get that much jail time. Gupta will remain free on bail until his sentencing on Oct. 1. In response to questions on whether the verdict will be appealed, attorney Gary Naftalis maintained that Gupta was "innocent" and that wiretaps of Rajaratnam's phone line where he mentioned tipped information -- likely crucial to to the conviction -- were hearsay. "This is round one," Naftalis told the press outside of a federal court in Manhattan.